life in general. Perhaps he should start a column in a newspaper somewhere. The senior girls then started to play, with Julia McClean and Lucy Jones starting their campaign, which proved to be another hard challenge, this time against Eastbourne, Benenden, St Mary’s and Repton. Bronwyn Walker-Rouse and Ananya Rajesh, our second pair, really started to gain momentum in their matches, with a tenacious attitude to fight for every point. This strategy started to pay dividends as they started to win more games, but sadly a victory eluded them and they too qualified for the Plate competition. Here both pairs continued to develop, Julia and Lucy suffered a narrow defeat against Benenden, Bronwyn and Ananya continued with some spectacular tennis, but were beaten by Sedbergh and St Mary’s. This was in spite of Tapper’s Top Tips, which became the buzz words for the trip. 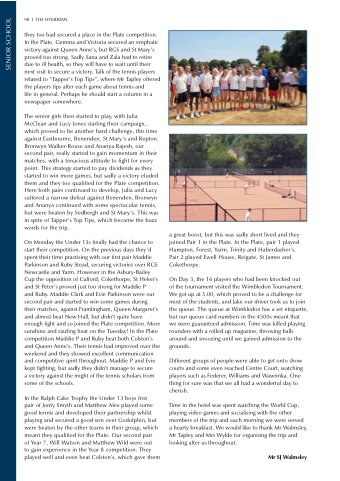 a victory against the might of the tennis scholars from some of the schools. a great boost, but this was sadly short lived and they joined Pair 1 in the Plate. In the Plate, pair 1 played Hampton, Forest, Yarm, Trinity and Haberdasher’s. Pair 2 played Ewell House, Reigate, St James and Cokethorpe. of the tournament visited the Wimbledon Tournament. We got up at 5.00, which proved to be a challenge for most of the students, and Jake our driver took us to join the queue. The queue at Wimbledon has a set etiquette, but our queue card numbers in the 4500s meant that we were guaranteed admission. Time was killed playing rounders with a rolled up magazine, throwing balls around and snoozing until we gained admission to the grounds. Different groups of people were able to get onto show courts and some even reached Centre Court, watching players such as Federer, Williams and Wawrinka. One thing for sure was that we all had a wonderful day to cherish. Time in the hotel was spent watching the World Cup, playing video games and socialising with the other members of the trip and each morning we were served a hearty breakfast. We would like to thank Mr Walmsley, Mr Tapley and Mrs Wylde for organising the trip and looking after us throughout.